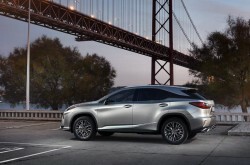 One of the first of the large luxury hybrid SUVs, the Lexus RX, has been overhauled. 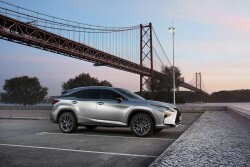 Lexus' fourth-generation hybrid SUV majors on quality and comfort, but where's the innovation? It's the new Lexus RX and you could be forgiven, in some ways, for mistaking it for the old Lexus RX. Not in terms of style; in that arena at least Lexus has made a fairly dramatic step forward. The design is far more aggressive and in-your-face than it previously was, but not in an unpleasant sense. It won't be to all tastes - some will find the big, gap-toothed grille and jumble of lines and angles a little too much to deal with, but pick the right colour and the right spec and it actually starts to look pretty handsome. That goes double for the interior. 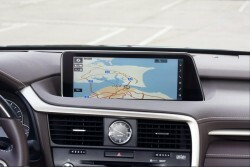 There's a big, handsome new central screen (which, at 12.3 inches, is one of the largest infotainment screens around) and gorgeous, buttery-soft leather is draped over almost every surface. If you can find a better-built car interior than this then you'll be doing well. It's also more spacious than before - there's an extra 50mm in the wheelbase, decent legroom in the back and a big 539-litre boot. Add all that to the comfy seats and the tomb-like silence inside and you have a pretty pleasant package. Look a little closer, at some of the details, and things start to take a slight turn for the worse. Yes, the RX is spacious, but there is no seven-seat option and Lexus appears to have abandoned previously-held plans for such a model. The cabin quality is unimpeachable, but there are some rather clunky switches and buttons and the graphics used in that big display screen look rather old-hat. And then there's the drivetrain. Lexus prides itself on being one of motoring's great innovators and there's no question that the brand has done much to move the hybrid game forward over the years. But the new RX uses exactly the same engine and hybrid combination as the last model. It has been tweaked - power is up to 313hp and Lexus' engineers say that they can now get more power, more reliably out of the nickel battery stack, but it's lacking the modern tech appeal of rivals that can offer more up to date lithium-ion batteries as well as plugin charging options to allow them go for as much as 30 miles emissions-free on a charge-up. If you drive the RX in very specific circumstances in a very specific fashion, it's lovely. Keep it cruising on the motorway or amble around town and it's comfy, smooth, incredibly quiet and relaxing. The 3.5-litre V6 engine is beautifully quiet and the ride quality feels fine. However, take the RX out of its very narrow comfort zone and it all falls apart a bit. It doesn't have the beautiful steering balance of Lexus' other models such as the IS and GS saloons, so through a series of corners it feels a little ponderous and unenthusiastic. If those corners are uphill, then you will have to put up with the CVT automatic transmission allowing the engine to constantly drone on at high revs in search of acceleration, something that becomes incredibly tiring after a very short space of time. It will also simply not deliver the fuel economy its official figures suggest it to be capable of unless you, again, drive it in a very specific fashion. It's a problem with all hybrid cars, but it's especially stark in the RX. Over a day of mixed city, suburban, country and motorway driving, we managed to average just over 30mpg - a long way from the 52mpg advertised. Now, there is a lot to be positive about. That cabin, for a start, makes up for a lot of the RX's dynamic and drivetrain shortcomings, as does the knowledge that it will very probably never, ever break down or fail to function as it should. But, as ever with a Toyota or Lexus hybrid, that CVT gearbox spoils what should be a pleasant, refined drivetrain and those trading into an RX in search of economy are going to be disappointed. Plus, Lexus is saying that both lithium-ion batteries and plugin capability are things that (a) buyers don't really want nor need yet and (b) it can achieve its results with cheaper and more robust nickel batteries. All of which seems like a disappointingly conservative position for a company prideful of its innovation to date. At least it will be safe. All models come with ten airbags as standard and all will also come with a comprehensive safety package that includes radar-guided cruise control, lane departure warning, blind spot monitor and more. As a replacement for the outgoing RX, the new RX is actually pretty good. It's beautifully made, more handsome by far and owners of the old one will be used to the whims and ways of the hybrid system. As a rival to the likes of the BMW X5 40e, the Audi Q7 e-tron and the Volvo XC90 T8 Twin Engine though, the RX has fallen badly behind in the tech race. Those rivals, for similar money, can all offer so much more.